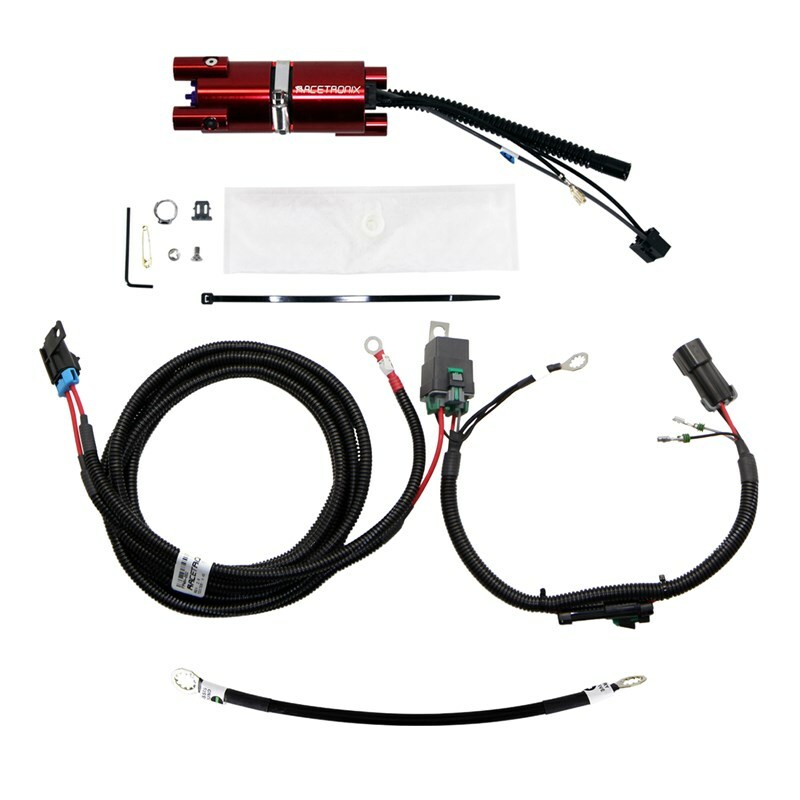 The FPA-001B is recommended for factory HP upgrades to 600HP @ 58PSI using the factory lines and fuel pressure regulator. HP support may vary for N/A or F/I motors. Please factor in a 20-25% safety margin between what your motor needs and what your fuel system can supply. The 1999 & up LS1 F-body cars have a pump that is inside a plastic fill-bucket. The fill-bucket is equipped with two inlets on the bottom. The equalization checkvalve is used to filAl the bucket when the level of fuel in the tank is greater than in the bucket. The equalization checkvalve does not allow fuel to exit the bucket. The venturi system's inlet is a combination checkvalve and powered suction system. The factory pump supplies pressurized fuel via a small tube which feeds a calibrated jet inside the venturi system. This jet of fuel shoots across the base of the checkvalve inlet thereby creating a suction effect which draws more fuel from the bottom of the tank through the filter sock. This venturi system keeps the bucket full all the time even when the fuel tank is almost empty. A full bucket keeps the pump immersed in fuel regardless of the tank level so that when the tank is low on gas and you are doing some hard cornering or acceleration the pump does not run dry and start aerating (air bubbles) the fuel. This happens as the fuel sloshes from side to side in the tank leaving the center low on fuel. This can cause detonation and possible engine damage. The 99+ F-LS1 cars with plastic tanks have no baffling in them so the bucket is very important. The bucket also allows the car to operate with lower fuel levels in the tank due to its scavenging effect. The fill-bucket improves motor crank-to-run time as the priming time is reduced under most conditions. The return line feeds the pressure regulator on the fuel module which diverts fuel back into the bucket so that the unused fuel also helps keep it full at all times. Keeping the pump constantly immersed in gas within the bucket can extend the pump's life by not allowing it to be exposed to open air. Open air within the tank contains moisture and in time will cause the pump to rust / seize up especially if left to sit for long periods of time without the tank topped-up (i.e. winter storage).